As anyone who has ever gained even a little bit of muscle mass will tell you, your muscles don’t just magically grow – you have to put in the work. Of course, a great deal of the work is making sure you have a balanced diet and you’re fitting all of your macronutrient and caloric needs. However, your diet won’t matter if you never hit the gym and put the time in under the bar. Exercising is the only way to build muscle, but how does muscle actually grow? What are the mechanics? In this discussion, we’re going to talk about micro tears – what they are, how they happen and why they are necessary. Our muscles aren’t just made up of iron, blood and sweat – muscles are a series of fibers woven together to create a working machine. They aren’t constructed of only one type of fiber, but 3 different types. Human muscles are composed of fiber types I, IIA and IIB; or, more specifically, slow-twitch, fast-twitch and very fast-twitch. Type IIB is “high threshold”, which means it is only recruited for the highest intensity exercise, i.e. high-rep, explosive exercises such as the exercises usually included in any hypertrophy-centric workout plan. Look at our home gym guide to see the kind of equipment you need for these workouts. The “twitch” refers to the fiber’s contraction speed, or time to peak power. As you may have guessed, slow-twitch fibers contract more slowly than fast-twitch fibers. Easy, huh? Your slow twitch muscles will be more recruited during endurance activities, steady state cardio or static holds, and your fast-twitch muscles will be recruited when doing bench press, squats, jumping, sprinting or doing a variety of Olympic lifts like snatches or cleans, as they require quick, sudden movements. Now, your muscles aren’t going to grow simply through their recruitment, or even a buildup of lactic acid which causes your muscles to burn while you’re pumping out higher rep sets. Your muscles will grow from the causation and reparation of micro tears. If you damage your hands with an abrasive material every day, what happens? You build calluses in the spots of the abrasion. This is the body’s response to damage, to get tougher in the places that are being damaged, and it’s no different with your muscles. When you exercise, you place a lot of stress on your muscles, which causes them to develop very small, microscopic tears in them. If you have ever had, or known someone who has had a torn pec, a torn hamstring, a torn ACL or bicep, this is not the same type of tear. Major muscle tears are an injury that can have effects anywhere from ruining your workout to necessitating surgery. These micro tears are necessary for your muscles to grow, as without damage (a stimulus), there can be no response from the body. The soreness you experience the day (or 3 days if it was leg day) after your workouts are due to all of the micro tears in your muscles, and act as assurance that you got a good workout in. These micro tears happen in every fiber of the muscle recruited for the exercise. So, in a standard workout, you’d be recruiting all 3, and thus all 3 types of fibers would experience micro tears. Bodybuilding and hypertrophy workouts tend to focus on recruiting the fast-twitch muscle fibers (type II), because they grow the biggest. Type I fibers aren’t likely to grow very much, because the fibers have a small cross-sectional area and account for little in terms of sheer volume of your muscle. So what do we have so far? The different fibers that make up your muscle and the little tears that occur in them from exercise. What now? Do we just have ripped muscles forever? The act of creating these micro tears in the muscle is to provide the body with stimuli to come and give these muscles some attention, and by attention, I mean nutrients. When your muscles are damaged, your body will recruit amino acids (the building blocks of proteins) to come and repair your muscle. However, as a coastal city might build a mightier dam after a flood, the body recognizes that this muscle will be subject to this type of damage and rebuilds the muscle bigger and stronger to adapt to this new stimulus. This is exactly why it is important to get enough protein into your diet when you are trying to build muscle. If you are tearing up your muscles and you don’t have enough amino acids in your body to rebuild them, it’s going to take a lot longer to repair those micro tears and rebuild your muscles. Again, hypertrophy is more concerned with your type II muscle fibers. This is why bodybuilding workouts are generally high-rep, explosive movements like bench press, squats, deadlifts, overheaded presses and other explosion-based exercises. This is also why a common cue in lifting is to “explode up”. Moving the weight as fast as you can while contracting the muscle is what is going to recruit those fast-twitch muscle fibers, develop the micro tears and bring in those aminos to rebuild. 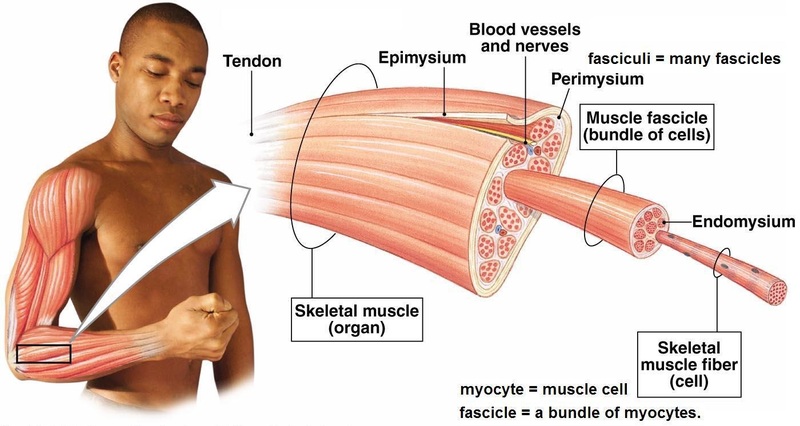 If you are using too light of a weight, the muscle won’t have adequate stimulus and it won’t respond; conversely, if you are using a heavy weight and are doing low reps (1-5), your body doesn’t have time to recruit the IIB muscle fibers and instead only recruits the I and IIA, which means that you’re leaving out the muscle fiber with the highest cross-section and not as much growth will occur. Low reps also mean less time under tension, which means less micro tears to repair. 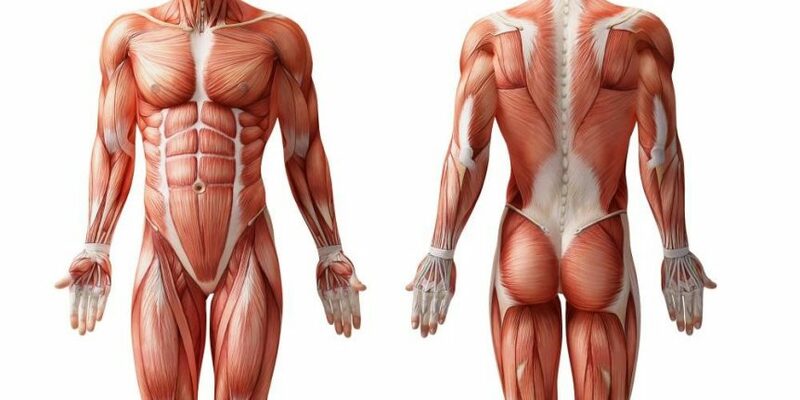 It’s important to know how and why your muscles grow. Having a mind-muscle connection is highly underrated when developing your physique. If you know how all of your muscles work, what they need and how they grow, there is little to stop you from achieving your fitness goals. So keep in mind what muscle fibers you want to fire, develop your exercise plan and get under the bar! hi i’m MariaA.Crosbie i have strained quads,and a micfrofiber tear in my right leg,i’m going for a sonogram on my leg to see how bad kit is,and get an mri,what else can i do to repair it,i can just about walk,i’m using a walker to get around,and it’s very hard for me,to gety out of my house to gvo any place,and i’m supposed to have a kidney transplant,but i can’t until this is taken care of,and the tear i have in my right hand,wrist,and thumb too. Awesome explanation, i try to work out to gain muscle mass and getting absolutely nowhere. Well plus i dont take in enough calories either. But this explanation you gave and the video Tai sims it uo quite well. Now all i need is motivation and a program to follow. Thank you veey much for the information. Oh, if you could recommend a program for bigger arms chest and legs, id be forever indebted!